New and modern. In a quiet location with a wonderful garden. 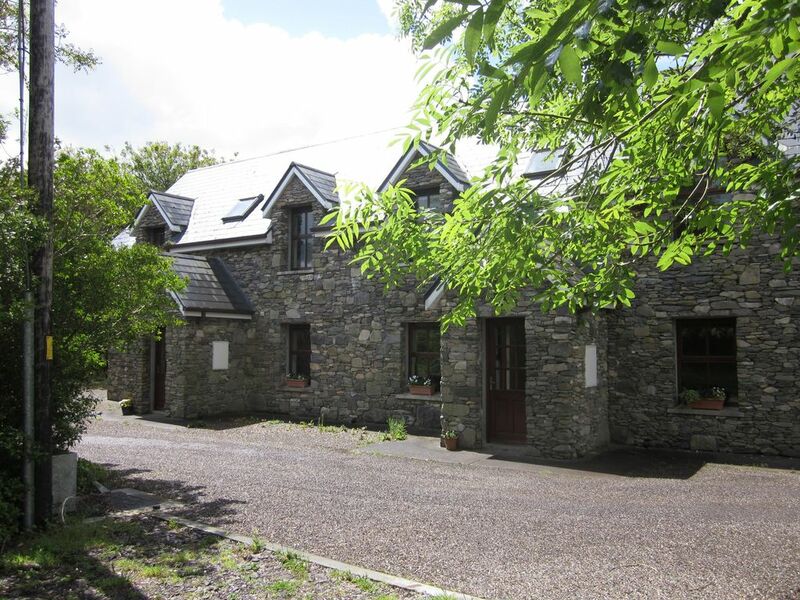 Ballybeag Cottages are located in Ventry, a beautiful little village located 6 km west of Dingle Town. The bay of Ventry stretches for miles and is due to its location a safe place for swimmers and also suitable for swimming with children. We are surrounded by a beautiful landscape, close to the Slea Head Drive, the wild-romantic views offers _- impressions that you will not forget. The cottage has 2 bedrooms with bathroom, kitchen and living room A sofa bed in the living room allows up to six people to sleep comfortably. The kitchen is modern and furnished with all the comforts that make your stay pleasant. Our garden is unique. Safe for children playing and relaxing for everyone ... A small paradise with big trees, colorful flowers and lovable birds. Quiet and relaxing, Ballybeag is the perfect place for 'Tripping around Dingle Peninssula' and evening recreation and relaxation. Ventry, or Ceann Tra as it is called in Irish, is in the heart of the Dingle Peninsula, Corca Dhuibhne. Daingen (Dingle) is the capital of this enchanting peninsula. In Dingle you will find restaurants and pubs, traditional Irish music concerts, supermarkets and other shops selling Irish craftsmanship. Why not visit the aquarium, or take a boat trip to the islands or to Fungie, the Dingle Dolphin. Fungie came to Dingle about 20 years ago and never left us! He also likes Dingle! Ventry is just 10 minutes from Dingle. In Ventry you can go to the beach. Ventry beach is beautiful. It is a safe beach for swimming. Or maybe you like to ride and enjoy a gallop along the sea! The hills around Ventry offer views you will never forget. Mount Eagle and Mount Eagle Lake, for example. The Blasket Islands are worth a visit, Gallarus Oratory and the many ruins, cemeteries with ancient Celtic crosses, fascinating even for non-archaeologists. There is so much to explore. And Ventry is in the center of the peninsula. Ballybeag is in the perfect location to totally enjoy this fascinating county. And when you get tired of exploring at the end of the day, Ballybeag awaits. A little oasis, like a second home. On the first floor there are 2 bathrooms. One has a shower, the other is a full bath with shower. Downstairs there is a toilet. Towels are supplied. Ballybeag is newly built and to a good standard. The decor is of the highest quality. The kitchen is furnished complete with all modern amenities. Nicely appointed semi-detached cottage. Owner was friendly and accommodating. A bit off the beaten path, so a nice respite from the tourist crowds of Dingle. Some of the best showers we experienced in Ireland. The property is located in Ventry is a short 8 km drive from Dingle and is a perfect location to relax and unwind. The accommodations are modern and clean. Very country and yet close to Ventry and Dingle. Clean and appealing. Our family truly enjoyed our time in Ventry at BallyBeag Cottages. The cottage met our family's needs in every way, quiet, secluded, a clean and lovely space for everyone, close to areas of interest, and access to toys for our grandson. Our host was very welcoming and helpful. Enjoyed our trip to Ireland in part to the time spent in Ventry at Ballybeag. Great location with comfortable lodgings. If needed at the cottage. The cottage itself is very comfortable. Wi-fi was somewhat intermittent which is not unusual for that area. It worked the best upstairs in the bedrooms by the windows. Ventry was a lovely location to enjoy local hikes, the Ventry beach and driving Slea Head Drive. This scenic drive is a must and there are many opportunities for exploration. The Skipper Restaurant in town was also very good. Dingle Town is a quick 6 mile drive and offers many pubs, restaurants and a large supermarket. Great location not in busy Dingle. Great beach and restaurant close. Sara was helpful. Great place to be out of busy Dingle with beautiful beach near and good restaurant Skippers. Ventry is a small, beautiful and friendly village. Next to the post office / shop you will find a restaurant, a cafe and the pub. It's great to sit outside at the pub with a fine beer and enjoy a wonderful panorama: the beach that stretches for kilometers, Mount Eagle, with the mountain lake, the sun says good night and retreats behind Mount Eagle (in summer it can to be at 10.00 pm), the fishermen come home from the sea; it is really peaceful and quiet. But if you want to go to a concert, with traditional Irish music there is a choice of over 50 pubs, mostly with live music, shops and restaurants, boat trips, Fungie, the dolphin, and much more, Dingle is just 10 minutes from Ventry and offers something for everyone. Slea Head, Gallarus Oratory, the islands (Blakset islands), fantastic cliffs, small sandy beaches, hills with incredible views; Ventry in the center of the peninsula is ideally located for exploring. Golf: Lying by the sea, with spectacular views, lies Ceann Sibeal. It is an 18 hole golf course. Very popular with local golfers and visitors. Ceann Sibeal is in an idyllic location. Enjoy a round of golf and enjoy the wonderful atmosphere of the Ceann Sibeal Golf Course. Ceann Sibeal, Sybill's Head in English, (check out the legend of Queen Sybill from a local golfer) is just 3 m from Ballybeag. Der Preis kommt auf die Saison an und variiert von 250..00 Euro bis 690.00 Euro in der Hochsaison. bitte fragen sie an wenn Sie noch extra info brauchen.